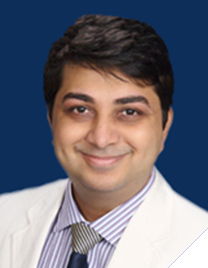 Home » About Us	» Meet Our Physicians » Saurabh Khakharia, M.D. Saurabh Khakharia, M.D. is an Orthopaedic Surgeon with Advanced Fellowship training in Adult Reconstruction, Joint Replacements, Sports Medicine, Limb Lengthening and Deformity Correction. He serves as a Chief of Adult Reconstruction and Joint replacement at Atlanta Orthopaedic Institute (also known as Atlanta Knee and Shoulder) and Co-Chief Adult Reconstruction Service, Department of Orthopaedics, GME services at Atlanta Medical Center, Atlanta, Georgia. Saurabh Khakharia, M.D. has been awarded as one of the Americas most compassionate doctor in 2011 and 2012. Also he has been awarded with patients choice award 2011,2012,2013. After graduating with honors and completing his residency and Diplomate National Board in Orthopedic Surgery in India, he completed his training/fellowships at Hospital for Special Surgery, New York, NY (Ranked no.1 Hospital in Orthopaedics in United States); Medical college of Virginia-Virginia Common Wealth University and Insall Scott Kelly Institute (ISK Institute)/Lenox Hill Hospital, New York, NY. Whether it’s non-operative management, arthroscopy, tissue-sparing joint replacement or more complex revision surgery, Dr. Khakharia’s goal is to combine cutting-edge technology & techniques to provide patients the best orthopedic care possible. He aims to meet patients’ individual needs through comprehensive evaluation and treatment designed to help them achieve an active, pain-free lifestyle. He has presented his work at various National and International orthopedic meetings and has authored articles in medical journals and book chapters in Orthopaedics. He is a member of several National and International medical societies including Clinical Orthopedic Society, USA; American Medical Association, International College of Surgeons, USA; American College of Sports Medicine and Southern Orthopedic Society, USA.